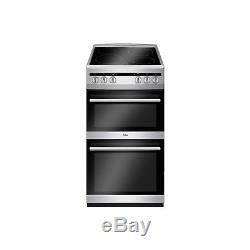 Amica AFC5100SI 50cm Double Cavity Electric Cooker With Ceramic Hob - AFC5100SI. Fan assisted, so you're ensured perfectly even cooking results wherever you place your dishes in the main oven. With a separate oven and grill you can whip up a meal and sides all at once. The smooth ceramic hob heats up fast and its super easy to wipe away any food splatters. It boasts an enamel interior to prevent food from sticking and fusing for an easier clean. Residual heat indicator lets you know when its safe to clean the surface. This all-in-one freestanding double cooker is pefect for kitchens tight on space, as it packs an oven, a grill and a ceramic hob into a narrow 50cm width frame. Up top, theres an electric ceramic hob with four zones of varying size to accommodate all your pots and pans. And, thanks to the hobs smooth surface, you can wipe away any spillages quick and easy to keep it looking its best. Plus, each zone comes with a residual heat indicator that lets you know when the surface has cooled to a temperature that's safe to clean. The main oven boasts a generous 64L capacity thats primed for cooking large family meals. Its fan assisted too which means it circulates the heat to ensure your food cooks evenly across all shelves, so you can cook multiple dishes at the same time. The top cavity provides 41L of space and functions as an electric grill, which comes in handy for preparing smaller items and snacks or for keeping your food warm while the rest of the meal cooks. Plus, theres even a grill pan thrown in for good measure, so you can get grilling straight away. Inside, the oven is lined with a non-stick enamel coating to prevent food and grease from sticking to the sides, so youll be able to wipe clean any splatter with ease. Both ovens have a double glazed door, which not only maintains a constant temperature within, it also makes it incredibly energy efficient. It's been rated A/A for energy efficiency, so you can rest assured it'll barely make a dent in your electricity bills. Dimensions: H90 x W50 x D60 cm. Bottom cavity: 64L Fan assisted oven. Hob: Ceramic hob with 4 zones. Functions: Fan oven, electric grill. Included: 2 Shelves, 1 Grill pan handle set. Electric oven and separate grill. Electric ceramic hob with 4 zones. Fan assisted cooking, ensures even cooking results on every level. 64L Capacity main oven, plenty of space for family meals. 41L Capacity grill for a quick snack or finishing off a meal. Clean and simple design with easy to use, durable inox black capped knob controls. Double glazed oven doors lock in heat, maintaining a consistent temperature. Two interior lights makes it easy to check up on a dish without letting heat out of the oven. Removable inner door glass allows for a thorough clean. Rated A for energy efficiency, kinder to the environment and your bills. Rated electrical power: 9.8 kW. 4 customers have bought and rated this product, giving it an average score of. Getting the Right Products for You Each and every order you place is checked by one of our experienced sales team. We'll take a look at your order and make sure that the products you have chosen are suitably matched. If we have any special offers or alternatives that we think might be a better suited, we'll get in touch to let you know and discuss the options over with you. If you'd like to pay by card, please have your e-bay user ID and item number ready and call 01484 448 969 with your card details. Nearly all orders arrive on time and in good condition but occasionally goods can get lost or damaged in transit, we do our best to prevent this by working the the highest quality couriers. The item "Amica AFC5100SI 50cm Double Cavity Electric Cooker With Ceramic Hob AFC5100SI" is in sale since Saturday, June 30, 2018. This item is in the category "Home, Furniture & DIY\Appliances\Cookers, Ovens & Hobs\Ovens". The seller is "buyitdirectdiscounts" and is located in Huddersfield.